The sublime Julianne Nicholson heads up an exceptional cast in the latest from actor turned writer/director Matthew Newton (From Nowhere). Nicholson plays a troubled woman recently released from prison after ten years who wants to reconnect with her son. She signed over guardianship of the baby to her sister and brother-in-law, who now have major doubts about sharing custody of the child they raised as their own. Meanwhile, a young public defender, played by Emma Roberts, tries to help a juvenile inmate improve her circumstances while at the same time honoring her own commitments to her middle-class family. It’s clear that eventually the young attorney is going to represent the ex-con mom, but instead of coming together at the beginning of the film, these two characters don’t meet until the third act. By devoting most of Who We Are Now to developing each of these women before they join forces, Newton subverts the tropes and clichés that often make pictures like this come off like hackneyed movies-of-the-week. While the film features many of the narrative turns we expect from a story like this, they happen in unforeseen ways that feel utterly authentic and truthful. 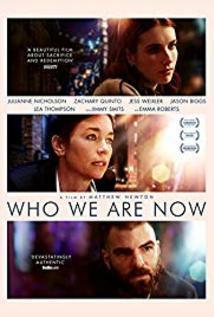 Who We Are Now is one of those perfect little indie pictures where not a single false note gets struck. Each individual we meet, regardless of their screen time, is richly developed and played by a first rate actor who finds even more subtle complexity in their performance. All the characters exist to serve the duel narratives, but each one feels like they could be the lead of their own movie happening off on some other screen. The film also features the most accurate depiction of the legal system I’ve seen on film outside of a documentary. It’s a crime that Nicholson isn’t better known because she’s one of the best actresses working today—and this is her finest performance since her commanding turn in Jeff Lipsky’s Flannel Pajamas (2006), another phenomenal indie that far too few people got to see. Exceptional cast and unexpected structure highlight story of an ex-con trying to regain custody of her son into one of those rare perfect little indies where not a single false note gets struck.